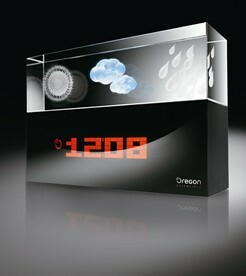 Oregon, the world leader in the producing of weather measurement devices, recently announced Crystal Weather Station. It displays weather information in the crystal using highlighting, laser engraved 3D icons. The display mode can be changed between time and indoor temperature with a wave of hand. The module also includes a clock which synchronized by radio with the worldwide clock. No any worlds about availability and price of the Crystal Weather Station. Oregon Scientific offers its Wireless Temperature and Humidity Data Logger – WMR101. It allows to monitors indoor and outdoor temperature and humidity, as well as heat index and dew point. The unit also includes radio controlled atomic clock. It allows to add up to 9 indoor or outdoor temperature and humidity sensors. Additionally, you may add Virtual Weather Station to receive weather information to your PC via USB and share it through your web site. The Wireless Temperature and Humidity Data Logger WMR101 is tagged at $89.90 including main wireless unit, one thermometer/hydrometer sensor and Virtual Weather Station software. 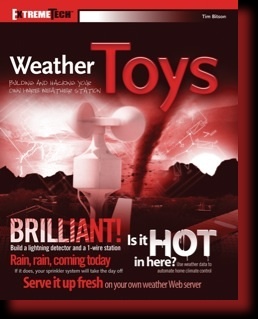 If you have ever wanted to build your own weather station, then Weather Toys by Tim Bitson is for you. The book covers all aspects of the weather measurement: from the basics of weather monitoring to the use of 1-Wire devices in the automation projects based on your 1-Wire weather station. I’d like to notice that the book doesn’t cover development under Linux (it says only about Windows and Mac). But since all examples there use Java it won’t be difficult to build and run them under Linux as well. For more information about this book and more examples, please, visit Weather Toys official site. Honeywell presents its Professional Weather Station. It comes with multiple wireless sensors: UV sensor, Thermo-hygrometer, Anemometer and Rain gauge that transmit data continuously. To display weather information unit has LDC display. Additionally, the it displays a time which synchronized via radio signals from the U.S. atomic clock (if you’re not US citizen this feature will be useless for you). The main unit is powered by the included adapter or four AA batteries. The included sensors are powered by a total of six AA and two AAA batteries. 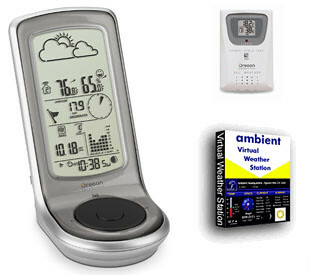 The weather station can be used as stand-alon or it may be connected to PC via USB port to extend its functionality. The price of Honeywell Professional Weather Station is $299.99. The weather station designed by Stefano Giovannoni is a really geek gadget. Using wireless connection it receives data from outdoor sensors – temperature, humidity etc and diplsays it. Additionally, it includes a self-setting atomic clock and alarm. The price of Giovannoni Weather Station is $150.00.